The Biblical World: Getting "De-Baptized"
If baptism, as I understand it, is an outward action, or sign, that reveals an inward conviction or identity, then yes. De-baptism would be a similar action. This would beg the question, though, what if the person changes their mind and wants to identify with the death, burial, and resurrection of Jesus at some future time. Should they be baptized? He needs to start a new organization that unbaptizes people. Maybe they can run people through some kind of huge blow dryer? What we have done, and what has been done to us, is part and parcel of who we have become. I can quit the church (or the Rotary Club or whatever) but I cannot change those parts of me that have been changed because I once was a member. We can start 'un-baptizing' people as soon as vegetarians can 'un-eat' the meat they consumed in their earlier, carnivorous, lives. If a person feels so strongly that a baptism must be removed, then by their very request they are demonstrating their belief that their baptism has marked them or had an effect on them in some way. If they considered it a mere symbol or false act made by their parents, it might not be a big deal to them and would not be an issue. The desire to be un-baptized has, in one way, re-emphasized the importance of baptism as a rite of the church, the meaning and importance of which may vary slightly depending on the church. 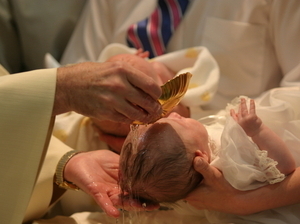 How do those who's tradition is to baptize adults feel about un-baptizing?